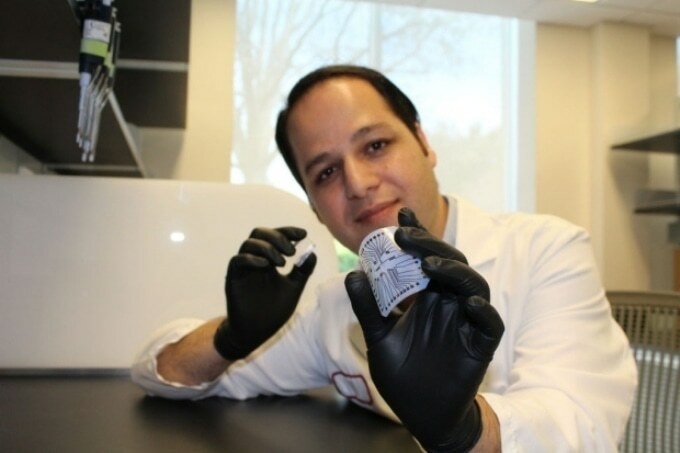 Rahim Esfandyarpour helped to develop a way to create a diagnostic ï¿½lab on a chipï¿½ for just a penny. CREDIT: Zahra Koochak. According to Ron Davis, PhD, professor of biochemistry as well as genetics and director of the Stanford Genome Technology Center, the new technique, with a production cost of just 1 cent per chip, could lead to a medical diagnostics revolution similar to the one brought by inexpensive genome sequencing. The technique has been described in detail in a study published online, in the Proceedings of the National Academy of Sciences, on February 6. The senior author of the study is Davis, and the lead author is Rahim Esfandyarpour, PhD, an engineering research associate at the genome center. The low-cost lab-on-a-chip technique has the ability to globally improve diagnostic capabilities, specifically in developing countries. In low-income nations, the survival rate of patients with breast cancer is merely 40%, which is half of the rate compared to the survival rate in developed nations. The main reason behind this discrepancy is the inferior access to early diagnostics in the low-income nations. Even other fatal diseases such as tuberculosis, malaria, and HIV have higher prevalence and poor patient outcomes in developing nations. This scenario can be reversed by ensuring better access to inexpensive diagnostics, as most diagnostic equipment costs thousands of dollars. Enabling early detection of diseases is one of the greatest opportunities we have for developing effective treatments. Maybe $1 in the U.S. doesn’t count that much, but somewhere in the developing world, it’s a lot of money. The new lab on a chip is a two-part system including a combination of electronics, microfluidics, and inkjet printing technique. The first part is a clear silicone microfluidic chamber in which a reusable electronic strip and cells are housed. The second part is a regular inkjet printer that uses commercially obtainable conductive nanoparticle ink to print the electronic strip onto a flexible polyester sheet. We designed it to eliminate the need for clean-room facilities and trained personnel to fabricate such a device. Esfandyarpour is an electrical engineer by training. He added that the time needed to produce one chip is as less as 20 minutes. One of the applications of the chip, which is designed to be a multifunctional platform, is that it enables the analysis of different types of cells without the need for using magnetic or fluorescent labels conventionally used to track cells. Such a label-free technique for the analysis of cells not only considerably enhances the precision but also avoids the need for lengthy labeling processes. The design of the tool enables even small-volume samples to be analyzed for a variety of assays. The research team demonstrated the ability of the tool to capture single cells from a mixture, to count cells based on cell types, and to isolate rare cells. Also, the cost of such multifunctional biochips is considerably less when compared to the individual technologies for performing each of the functions. For instance, the cost of a standalone flow cytometer machine used for sorting and counting cells is $100,000, excluding the operational costs. “The motivation was really how to export technology and how to decrease the cost of things,” stated Davis. Davis explained that in the same manner in which inexpensive sequencing brought a revolution in health care and personalized medicine, the inexpensive nature of the new tool can democratize diagnostics. With the help of inexpensive sequencing technology, clinicians can sequence tumor DNA to recognize particular mutations and recommend customized treatment procedures. Similarly, with the new lab on a chip, early diagnosis of cancer can be performed by the detection of tumor cells circulating in the bloodstream. “The genome project has changed the way an awful lot of medicine is done, and we want to continue that with all sorts of other technology that are just really inexpensive and accessible,” stated Davis. Apart from achieving advancement in health care, the new technique can also accelerate basic and applied research. Esfandyarpour stated that the technique can also enable clinicians and researchers to potentially examine more cells within a short time span, to develop cost-effective ways of disease diagnoses, and to control stem cells to attain efficient gene transfer. The research team expects that the chip will transform the way in which people use laboratory instruments. I’m pretty sure it will open a window for researchers because it makes life much easier for them—just print it and use it. The research is an instance of the focus that Stanford Medicine has on precision health, where the ultimate aim is to expect and prevent disease in healthy people and to accurately diagnose and treat disease in ailing patients. Graduate students Matthew DiDonato and Yuxin Yang, postdoctoral scholar Nasine Gozde Durmus, PhD, and professor of electrical engineering James Harris, PhD, are the other Stanford co-authors of the study. A grant from the National Institutes of Health (grant HG000205) supported the study. The study was also supported by the departments of biochemistry and genetics.